Crabgrass and knotweed and grubs, oh my! seed each year. It loves hot, dry weather, and picks up steam just as fussier lawn grasses are giving up. It will take advantages of bare patches, especially hot areas by paved driveways and walkways. Quick fix: Hand-pull or spot treat with an organic herbicide. Cover bare areas immediately with sod. Management: Mow high – 3″ or more – from spring on. Taller grass shades the soil and keeps it cool, minimizing germination of weed seeds. Overseed any bare patches in fall, and fertilize with corn gluten in spring, which has been shown to have some pre-emergent benefits. 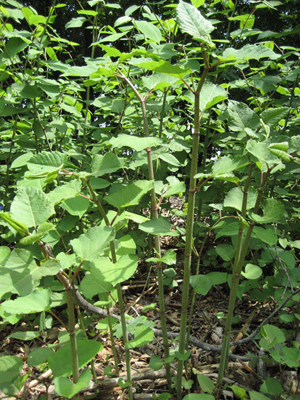 Japanese Knotweed is a perennial weed on the invasive list in Massachusetts. It can spread by seed, but it also develops a deep root system and will resprout from root pieces left in the soil. 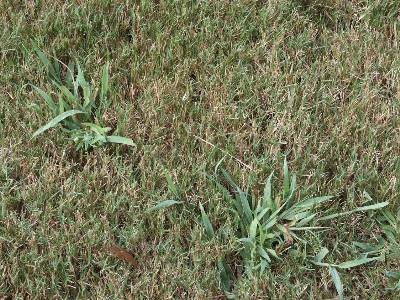 Eradication usually requires several seasons, even with the use of chemical herbicides. Quick fix: Cut or mow repeatedly to keep from flowering and spreading. Cutting also weakens the plant by keeping it from photosynthesizing (making food for itself). Management: Timing is everything. Do your final mow/cut in late June. 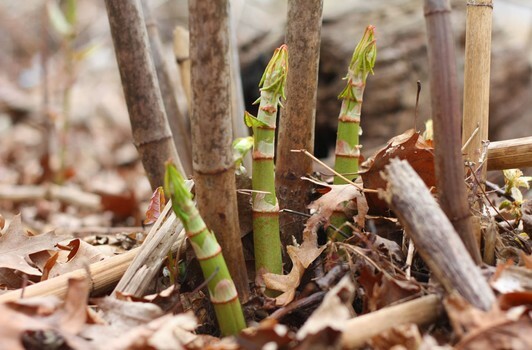 Allow plants to resprout until early August. Then, when the plant is at its weakest after flowering, cut to 12″ and inject trunks with organic herbicide. Repeat for 3-5 seasons. Grubsare the larval lifestage of certain insects, including Japanese beetles. They feed on plant roots, including the roots of turf grass. With serious infestations, predators digging for the grubs may do more damage than the insects themselves. Quick fix: Application of beneficial nematodes (tiny worms that attack the grubs) in mid-late August can substantially reduce populations. Read label instructions carefully or hire a trained applicator. Management: A healthy lawn maintained organically can withstand a few grubs, whereas a stressed lawn will show damage quickly. Mow high, water deeply but infrequently, fertilize organically. 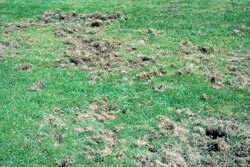 Note that synthetic pesticide treatments for grubs tend to also reduce the numbers of beneficial soil life and predators, so may hurt the lawn more than they help. If spot treatment is not enough for your lawn, keep in mind that mid-August through September is the ideal time to establish a new organic lawn.